NASA’s Curiosity rover is busy looking for signs on life on Mars. Its ground crew has also been beavering away on a simulator to let you see what it sees on the planet. Experience Curiosity puts you in control of Curiosity in a simulated 3D environment based on data from the actual rover, as well as NASA’s Mars Reconnaissance Orbiter (MRO). You can click around to move Curiosity across the red planet’s surface and get a close-up view through each of its cameras. The simulator lets you free-drive Curiosity and also send it to three preset destinations where it’s previously captured iconic images. You can also use your mouse to adjust its antenna and camera arm, and learn about how each of its parts work. “At three years old, Curiosity already has had a rich and fascinating life. 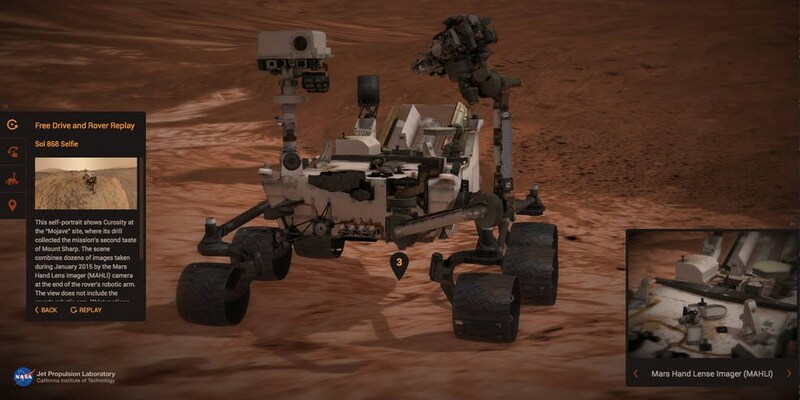 This new program lets the public experience some of the rover’s adventures first-hand,” said Jim Erickson, the project manager for the mission at NASA’s Jet Propulsion Laboratory. Last month, NASA launched Mars Trek, a Google Earth-style interactive map viewer for our planet’s next-door neighbor.